Image by marcopako  via FlickrApple's ways are so different from Google's and yet they go neck and neck. It is a study in contrasts. No free lunch? Come on. Undercover meetings! Stealth product developments! The world's most successful company is obsessed with privacy. ..... for a corporation so frequently discussed, Apple is poorly understood. 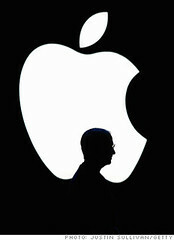 Its products are ubiquitous, but information about the institution is scarce -- which is exactly how Apple wants it ..... The business world keeps nattering on about the importance of corporate transparency, yet the most successful company in the world is beyond opaque. ...... Apple employees know something big is afoot when the carpenters appear in their office building. New walls are quickly erected. Doors are added and new security protocols put into place. Windows that once were transparent are now frosted. Other rooms have no windows at all. They are called lockdown rooms: No information goes in or out without a reason. ...... If it hasn't been disclosed to you, then it's literally none of your business. ...... the link between secrecy and productivity is one way that Apple (AAPL) challenges long-held management truths and the notion of transparency as a corporate virtue. ...... at Apple everything is a secret. .... loose-lips-sink-ships mentality: A T‑shirt for sale in the company store, which is open to the public at 1 Infinite Loop, reads: I VISITED THE APPLE CAMPUS. BUT THAT'S ALL I'M ALLOWED TO SAY. ....... Apple's airy physical surroundings belie its secretive core. ..... Unlike Google's famously and ridiculously named "Googleplex," where a visitor can roam the inner courtyards and slip into an open door as employees come and go, Apple's buildings are airtight. Employees can be spotted on the volleyball courts from time to time. More typically, visitors gaping into the courtyard will see a campus in constant motion. Apple employees scurry from building to building for meetings that start and end on time. ...... "And half the folks can't tell you what they're doing, because it's a secret project that they've gotten hired for." ....... Outside, Apple is revered. Inside, it is cultish ...... "There's only one free lunch at Apple, and it's on your first day" ...... the rationale is that when Apple launches a product, if it's been a secret up until the launch, the amount of press and coverage and buzz that you get is hugely valuable to the company. 'It's worth millions of dollars' ...... Apple's powerful senior vice president of product marketing, has been known to compare an Apple product launch to a blockbuster Hollywood movie opening weekend. ...... Apple fanboys camp out in front of Apple stores in anticipation of new Apple product releases in a way that is reminiscent of the lines that once greeted a new installment in the Lord of the Rings or Star Wars franchises ..... so they don't steal the thunder from existing products. If consumers know exactly what's coming, they may hold off on a purchase for fear it will be superseded by the next generation. .......... announcing products before they are ready gives the competition time to respond, raises customer expectations, and opens a company up to the carping of critics who are bashing an idea rather than an actual product. ...... Unfathomably, HP later "pre-announced" the sale of its PC business, inflicting immeasurable damage on a unit that accounted for nearly a third of its sales. (HP's board fired its CEO, Léo Apotheker, shortly after the announcement about the PC unit.) ....... Valley engineers love to swap stories about their work, but Apple engineers have a reputation for keeping to themselves. ..... "It's best in general not to talk about work." The mentality makes Apple stand out in the tech world. ..... People working on launch events will be given watermarked paper copies of a booklet called Rules of the Road that details every milestone leading up to launch day. In the booklet is a legal statement whose message is clear: If this copy ends up in the wrong hands, the responsible party will be fired. ...... You had to sign extra-special agreements acknowledging that you were working on a super-secret project and you wouldn't talk about it to anyone -- not your wife, not your kids. ...... "He'd say, 'Anything disclosed from this meeting will result not just in termination but in the prosecution to the fullest extent that our lawyers can.' This made me very uncomfortable. You have to watch everything you do. I'd have nightmares." ....... Company lore holds that plainclothes Apple security agents lurk near the bar at BJ's and that employees have been fired for loose talk there. It doesn't matter if the yarn is true or apocryphal. The fact that employees repeat it serves the purpose. ...... the Apple way is to mind one's own business. This has a side benefit that is striking in its simplicity: Employees prevented from butting into one another's affairs will have more time to focus on their own work. Below a certain level, it is difficult to play politics at Apple, because the average employee doesn't have enough information to get into the game. Like a horse fitted with blinders, the Apple employee charges forward to the exclusion of all else. ...... "We have cells, like a terrorist organization ... Everything is on a need‑to‑know basis." ...... Organization charts, typical fare at most big companies, don't exist at Apple. That is information employees don't need and outsiders shouldn't have. ...... the internal Apple Directory. This electronic guide lists each employee's name, group, manager, location, e-mail, and phone number, and might include a photograph. ..... The executive team, a small council of advisers to the CEO, runs the company, assisted by a cadre of fewer than 100 vice presidents. But rank doesn't always confer status at Apple. Everyone is aware of an unwritten caste system. The industrial designers are untouchable, as were, until his death, the cadre of engineers who had worked with Steve Jobs for years, some dating to his first stint at Apple. A small group of engineers carries the title of DEST, distinguished engineer/scientist, technologist. These are individual contributors with clout in the organization but no management responsibilities. ..... In terms of corporate coolness, functions such as sales, human resources, and customer service wouldn't even rate. ..... it isn't uncommon for employees to go places their boss cannot. ...... By and large, Apple is a collaborative and cooperative environment, devoid of overt politicking. The reason for the cooperation, according to former insiders, is the command-and-control structure. ...... Apple's culture may be cooperative, but it isn't usually nice, and it's almost never relaxed. ...... "The fighting can get personal and ugly. There's a mentality that it's okay to shred somebody in the spirit of making the best products." ...... "It's a culture of excellence," this person noted. "You don't want to be the weak link. There is an intense desire to not let the company down." ...... Apple's culture is the polar opposite of Google's, where fliers announcing extracurricular activities -- from ski outings to a high-profile author series -- hang everywhere. At Apple, the iTunes team sponsors the occasional band, and there is a company gym (which isn't free), but by and large Apple people come to work to work. "At meetings, there is no discussion about the lake house where you just spent the weekend," recalled a senior engineer. "You get right down to business." ...... "There is not a culture of recognizing and celebrating success. It's very much about work." Said another: "If you're a die-hard Apple geek, it's magical. It's also a really tough place to work." ..... Apple pays salaries that are competitive with the marketplace -- but no better. A senior director might make an annual salary of $200,000, with bonuses in good years amounting to 50% of the base. Talking about money is frowned upon at Apple. ..... "Sitting in a bar and seeing that 90% of the people there are using devices that your company made -- there is something cool about that, and you can't put a dollar value on it."